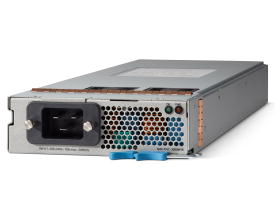 The Cisco Nexus 9500 platform supports hot-swappable, front-panel-accessible AC, DC, and universal AC/DC power supplies. N+1 and N+N redundancy modes are supported. The 3000W AC power supply is 80 Plus Platinum rated, providing more than 90 percent efficiency across typical workloads.